SPARC provides unique integration capabilities because it is not dependent on any specific user interface integration. SPARC allows you to integrate transactions into AIT and GP if you are using eConnect, custom integrations that directly update GP SQL tables, Integration Manager or other products that utilize eConnect. SPARC utilizes SQL triggers that call specific AIT stored procedures to update AIT work tables. To take advantage of these triggers and stored procedures, you need only configure SPARC in AIT. SPARC will take care of the rest. However if you have more specific integration requirements that do not fit into SPARC configuration, you can utilize the AIT stored procedures to add AIT distributions. – Always assign a default value to each parameter: never use a null value. If any value is null, error 22001 is returned in the Result output parameter. – Decimal Places are sometimes 1 less than value in the GP table. – Due From/Due To accounts are assigned automatically, so leave them 0. 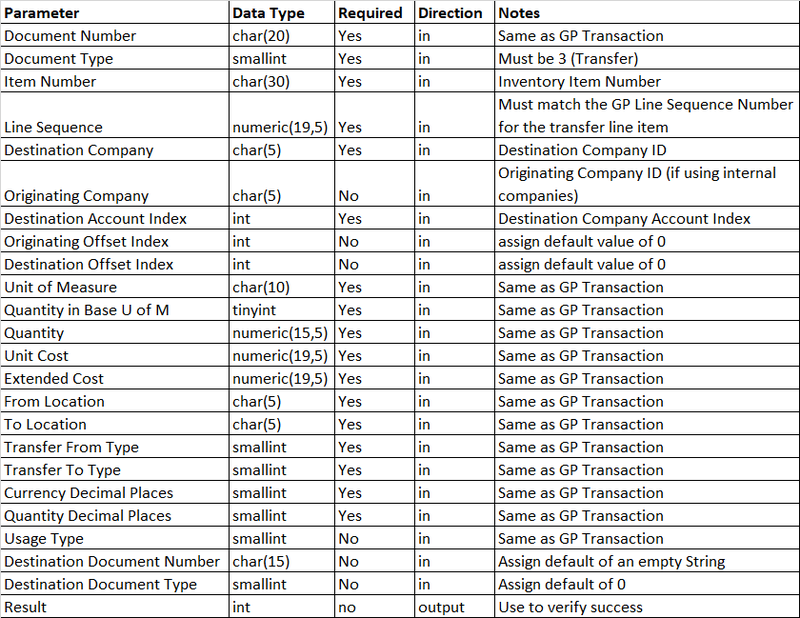 – Use the IC00100 table in the DYNAMICS database to lookup cross-company GL Account Indexes. – Multicurrency information can be assigned defaults if MC is not registered. If it is registered, they are required. – SPARC for Inventory is available in AIT for GP 2010 (build 11.0m117 or higher). Use this procedure to create a header record for an AIT Inventory Transfer. This should be executed before any AIT distributions are created. Use this procedure to create transfer line items. Always assign a default value to each parameter: never use a null value. You need to create the GP inventory line item before you can create the AIT line item.